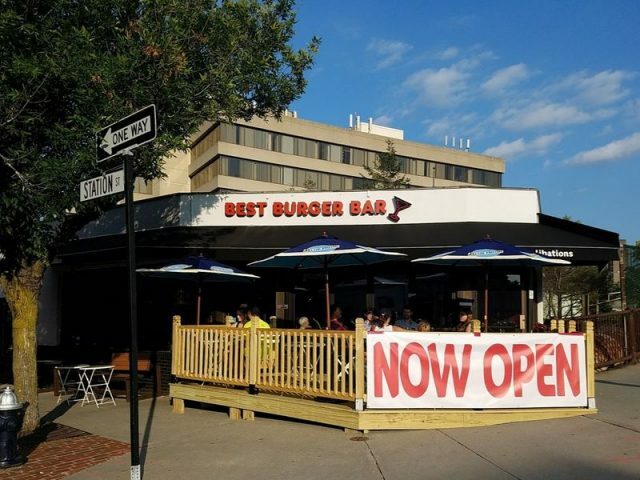 Best Burger Bar opened Aug. 10 hours after it got its liquor licence. At around 5:30 p.m. they opened and by 6 p.m. folks were already eating on the patio in the setting sun and a line wrapped around the reclaimed wood bar. Best Burger presumably competes with Magnolia Smokehouse and Matt Murphy for meat house on the block. But this is perhaps the only restaurant with a built out patio in the village. “There is a lot of enthusiasm behind the concept. I do not anticipate anyone will have beef with them for bringing another innovative dining experience in Brookline,” said Andy Martineau of the town planning department. The concept is a bit different from the rest of the meaty options around town say the guys over at Best Burger. “All of our burgers are dry aged burger, just like you could order in a stake house. That gives it a much more meaty flavor. Our real home run burger is The Farm,” said Nick Mallia, long time catering at Paris Creperie who has helped John Mascia launch. The Farm comes with a whiskey bacon jam, and a smear of foie gras black truffle. “It just pops in your mouth,” said Mallia. Look for an in-house poutine when the move to a full menu, added. On the menu are not just meat items. Look for the Portabella Mushroom Burger ($7.79) and Manchego cheese fries ($5.99). The portabella is marinated in a balsamic secret sauce, according to Wilson. That is accompanied by a slice of Havarti cheese, arugula, tomato and onion. The portabella is on a potato bun from Piantadosi Baking company, which keeps the bite fluffy and griddled, giving it a sweet carmelization. Eventually the plan is to upgrade to Iggy’s as more of the menu rolls in, said Wilson. “I know Brookline, we need veggie options,” said Mallia. And they’re coming. Chef Wilson makes a chick pea burger. There’s a BBQ pulled pork sandwich. (Think shredded pulled pork on a brisket hot dog). Former Jerry Remy’s Sports Bar partner, John Mascia, is behind the burger restaurant, which seats around 40 inside and 20 on the patio. Brother Cleve designed the drinks to come later. The natal queen is served inside a hollowed pineapple. Jack and Marion’s Catskill Vacation is named after the deli owners of Coolidge Corner fame. The plan is to start slow and then branch out. At this point there are only four local beers on the menu on opening night. Open for dinner Friday 4:00 p.m. to 11:00 p.m.
They’ll stick with those hours for a few days as they get their feet under them, said Mallia. Wednesday the plan is to bring the full bar menu out. The plan is to open at 11:00 a.m. every day and stay open until 10 p.m. Sunday through Wednesday. Thursday through Saturday they close at 11:00 p.m.